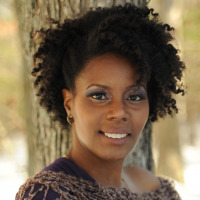 Asha J. Watson is a woman who loves God, people, and language. She fell in love with poetry at an early age and was first published at 15 years old. She discovered her passion for short stories in her twenties and rediscovered writing poetry, and the courage to perform at open mics in her thirties. As a Spoken Word artist, she is known on the mic as "Purple Reign". Off stage, she is a motivational speaker, entrepreneur, and community activist. She thoroughly enjoys mentoring others, especially the youth in her community. Asha currently lives in the DC Metro area but a huge portion of her heart resides in Oak Park, IL, her hometown.